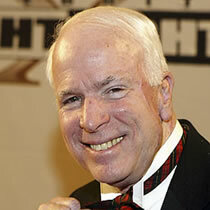 John McCain demonstrates just how little he understands the economy and the challenges Alaska's families face everyday. "John McCain just doesn't understand the challenges that working families face every day," said Alaska Democratic Party Chair Patti Higgins. "If he did, he would offer solutions to the families of Alaska who are struggling to get by instead of trying to defend and extend Bush's economic policies that have been devastating for Alaskans. Instead, McCain offers more of the same out-of-touch policies that do nothing to help Alaska's working families, and that's the last thing voters want."